HP Envy 4523 is an affordable all-in-one designed for relatively low-volume use in a small office or home office. With a small footprint, the device offers modern technology printing solutions with wireless capability that allows printing from mobile devices including smartphones and tablets. The all-in-one weighs 5.41 kg and measures 17.52 x 14.45 x 5.04 inches making it a light and small device. The printer is able to hold up to 100 sheets with a monthly duty cycle of 1000 pages. The device is able to print lab-quality colour photos with a print resolution going up to 4800 x 1200 dpi. 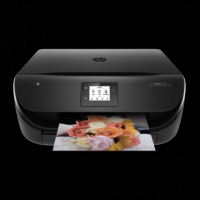 Thanks to its HP Envy 4523 ink cartridges that yield high-quality images. For black and white printing the resolution is up to 1200 x 600 dpi. With automatic duplexing and wireless connectivity options, it makes printing convenient for the user. 20 ppm print speed for draft mode and 16 ppm print speed for colour mode resembles a series of other HP envy printers of the same range. The device is compatible with Windows and Mac versions. HP Envy 4523 has a good quality printing, scanning and copying facility along with wireless capability that supports mobile printing. The device also supports third-party apps like Apple Airprint. Besides, the automatic duplexing feature can enable users to save on the running print costs. There is a lot to offer the general home users. But small workgroups and offices can go for this product only if they don’t require an ADF or fax function. How to check the estimated ink level for the HP Envy 4523 printer? You can check the estimated ink level of HP Envy 4523 ink cartridge from the printer control panel, printer software, and HP utility. Step 1: To know about the estimated ink levels from the control panel, touch the ink icon from the home screen. Step 2: To inspect the ink levels from the Windows software, open the HP printer software and press ‘Estimated Ink Levels’. Open the Hewlett-Packard folder in the application folder at the top level of the hard disk and open the HP utility. From the list of devices available at the left of the window, choose HP Envy 4523 series. After selecting the series, select ‘supplies status’ and the estimated ink level of individual HP Envy 4523 ink cartridge will appear. To return to the Information and Support pane, select ‘All Settings’. Note: If you have installed a remanufactured or refilled HP Envy 4523 ink cartridge or a cartridge that has been already used in another printer, the ink level indicator might be incorrect. Warnings: Ink level indicators and warnings are provided for the proper planning purpose. If you receive a low ink warning message, it simply indicates that you should be ready with a replacement cartridge in order to prevent any printing delay. Once the print quality is unacceptable, you should replace the cartridges. What should I do if the HP Envy 4523 pages are skewing? If the printer pages are skewing, make sure that the paper you have loaded in the input tray is aligned to the paper-width guides. If necessary, pull out the paper input tray and reload the pages in the correct manner (the paper guides should be aligned correctly). Load the pages into the printer, only when it’s not printing. Q. I cleaned the printhead of my HP printer a couple of months ago, but the HP Envy 4523 ink cartridges got exhausted much earlier. Is there a problem with my printer? A. No, please don’t worry as there’s nothing wrong with your printer; you performed printhead cleaning, which consumes some ink from your ink cartridge and it got exhausted earlier. It won’t happen the next time you use a new ink cartridge and as you won’t perform printhead cleaning again! Q. I’ve never used compatible HP Envy 4523 ink cartridges but plan to do that to cut printing cost. Will my printer adapt to compatibles smoothly as it’s only worked with genuine cartridges so far? A. Yes, your printer will not face any problem or undergo any change with compatible ink cartridges as they are exactly like the original cartridges. You will only be pleased with the big savings you will make with compatibles and the same quality of output you’ll get. Q. I have an HP Envy 4523 printer at home which I could not use for over four months. I tried taking a printout now but there’s some gap and lack of clarity in it. What should I do? A. The printhead nozzles of your printer seem to be clogged as your machine was not used for a long time. Please perform printhead cleaning, which is likely to resolve the issue. Q. I recently replaced HP Envy 4523 ink cartridge in my printer. When I removed the protective tape from its surface before installing it, a little ink came out of it and spilt over the desk. Is the cartridge damaged or can it be used? I’ve kept it out of the machine now and haven’t taken any printout yet. A. Please don’t worry as your ink cartridge, in all probability, isn’t damaged. Sometimes, a little ink comes out of a cartridge while you’re preparing it for your printer. From next time, pull the tape out holding the cartridge over a paper or waste bin so the ink does not fall on things around.